The problems started about a month ago, says Nikolai Kostylev, one half of the electronic duet IC3PEAK. The group would be headed for a concert, only for venue managers to cancel at last minute, citing threatening phone calls. There would be bomb scares; unannounced fire inspections; unexplained electricity failures; sudden urges to redecorate concert halls. There would even be arrests on arriving into town. The latest gig to be targeted was on Thursday in Voronezh, a grey, concrete city 400 miles south of Moscow. Only a fraction of the group’s fans were able to hear the group play a 20-minute concert after plain-clothed officers blocked entry to the club, itself a replacement venue. When tour manager Oleg Mitrofanov tried to accompany more fans into the venue, he was reportedly assaulted and pinned against the wall by police. The men in black claimed to be from health and safety inspectorate, following up reports of food poisoning. The state’s interest in post-modern techno culture does not seem to have come by accident. IC3PEAK are, in fact, only one of a number of groups to have come up against the authorities in recent weeks. On the same day that the band was battling “food hygiene officers” in Voronezh, the teen-band Friendzone saw a gig cancelled in Yaroslav, central Russia. Their repertoire, which includes such dark hits as “Maybe, Baby” and “Cute Boy” is, apparently, considered “extremist”. 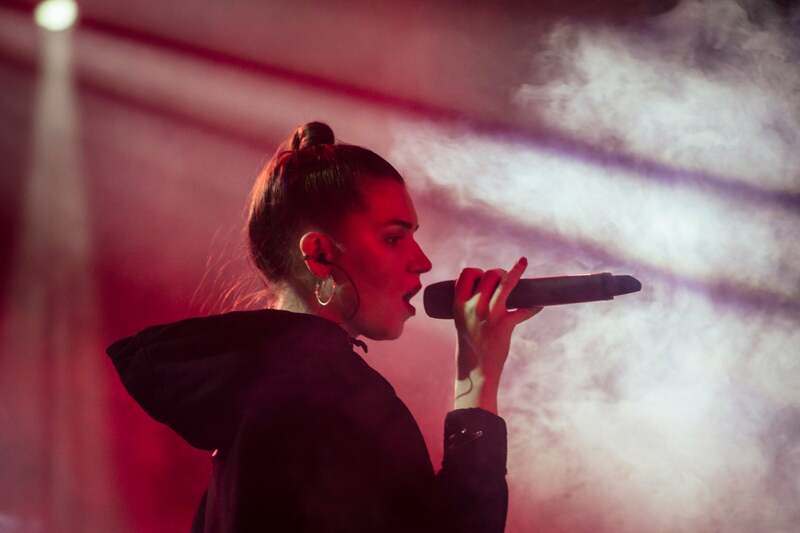 Meanwhile, the teen rapper GONE.Fludd cancelled a show in the northern city of Petrozavodsk, following an intervention by the local prosecutors’ office. Earlier, he said he had come under pressure from “every police agency imaginable”. Last month, another rapper, Husky (Dmitry Kuznetsov), hit the headlines after being imprisoned while on tour in the southern city of Krasnodar. Officials had warned venue owners in the city that the rapper’s lyrics were “under investigation”. Kuznetsov responded to a wave of cancellations by staging an impromptu concert on top of a car, after which he was arrested. He was released only after public outcry and the apparent intervention of unnamed Kremlin officials. What was interesting about Kuznetsov’s story was that the musician could barely be described as an opposition figure. His breakthrough hit, “stray bullet”, revealed, if anything, a lust for guns and gangster culture over politics. He has also lent his face to Kremlin-backed separatist fighters in Donetsk, singing, last year, a rap eulogy to Arseny “Motorola” Pavlov, the notorious separatist warlord assassinated in 2016. Lawyer Pavel Chikov, who represents some of the artists in question, says that the recent crackdown seems to have been calculated to be “concentrated and demonstrative”. The cancellations and arrests all seem to come from one central command, he says – though the exact decisions by local law enforcement “differ by region”. “The logic is the same – getting in the way – but there is variation from case to case,” he tells The Independent. According to one local website, which cites two unnamed sources within government, Russia’s security agency issued a black list of “undesirable” groups back in October. This was apparently in response to two traumatic episodes for the agency: one, a shooting in Kerch college, Russia’s “Columbine massacre”, in which 20 teenagers were killed; the other, a young anarchist’s suicide bombing attack on an FSB regional headquarters in the northern city of Arkhangelsk. But for Artemy Troitsky, a musiccritic credited with introducing western music to Soviet audiences, the crackdown brought back more distant memories. 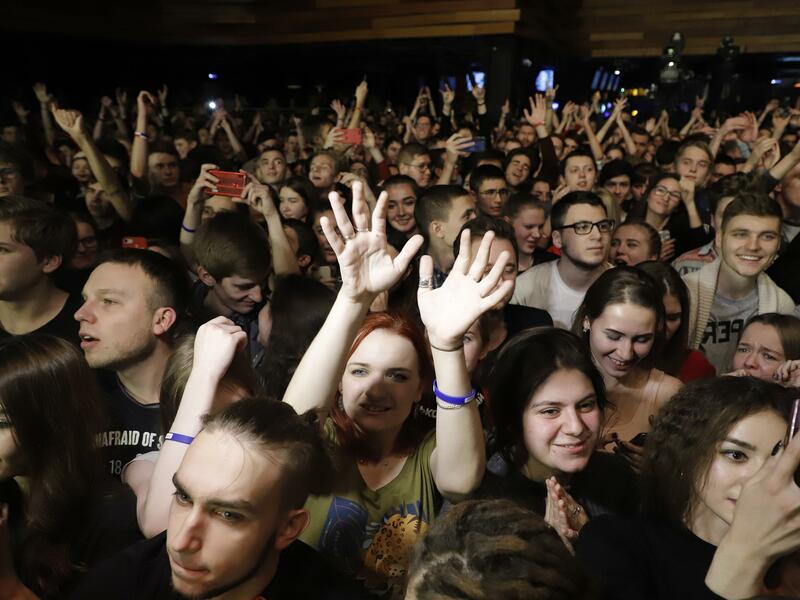 The critic describes the moves to ban concerts as a “ham-fisted response to the political awakening of Russian youth”. Russian teens are “different” from their “passive and cowardly” parents and “Putin-supporting” grandparents, he says. It’s a generation that Putin “seems to have lost”, and which now forms a significant part of the protest movement headed by opposition leader Alexei Navalny. If reports are to be believed, authorities have been particularly vexed by one of IC3PEAK music videos, the outrageously macabre “No More Death”. There’s no question the video consciously pokes around Russian taboo. It opens at the Russian White House, the seat of the country’s government, with Kreslina singing the lyrics: “I flood my eyes with kerosine; let everything burn; let everything burn. The whole of Russia is watching me; let everything burn; let everything burn.” It then moves to images of eating flesh in front of Lenin’s tomb, drinking blood, and riding on riot police in front of the Lubyanka, the infamous headquarters of the Russian security services. The group says that only those without a cultural background would fail to understand the “irony” of the work. Troitsky told The Independent that he became a fan of the group after becoming aware of the “sensational” video, and had successfully lobbied a London-based indie record company to offer the pair a record deal. And, he says, the authorities have “shot themselves in the foot” by unintentionally promoting the group’s work. It is difficult to predict which position will prevail, and already there are signs of major differences of opinion within the walls of the Kremlin. Two fairly prominent government figures, the head of the Foreign Intelligence Service Sergei Naryshkin and former culture minister Mikhail Shvydkoi, have already spoken out against “prohibitive measures”. And last month, another propaganda master, RT’s Margarita Simonyan, came out in support of the imprisoned Husky/Kuznetsov. Writing on Twitter, she said the musician had been freed from prison thanks to the interventions of “two or three” people in the Kremlin, and would now “hopefully” be left alone.